Coney Island, Katz's Delicatessen, and 30 Rock. New York, New York...the city so great, they named it twice! As America's biggest and busiest city, covering five boroughs and 304 square miles, it'll be a challenge to see everything the city has to offer in 48 hours, but if you keep up the fast pace that the city is known for, you might be able to hit some of the most popular attractions in town... and this tour only covers Brooklyn and Manhattan! Be prepared to be dazzled by the bright lights of the big city, because a trip to NYC is sure to be a whirlwind adventure. Start your trip by walking across the historic Brooklyn Bridge from Manhattan into Brooklyn. The views are picture-perfect, and the bridge itself is quite beautiful as well. Just, whatever you do, don't accidentally walk in the bike lane: that's a dead giveaway that you're a tourist! New York is known for a wide variety of cuisines, thanks to its history as a place where immigrants settled, but few restaurants have remained as important to the identity of the city as its Jewish delis. The smoked meat sandwich at Brooklyn's Mile End Delicatessen is great, and its matzo ball soup and the Reuben are classics, but if you're feeling fancy, try the poutine or the duck grilled cheese! Coney Island is a little far out, right at the tip of Brooklyn, but it's so iconic that it's worth the trip. From the Wonder Wheel and the Cyclone to Nathan's Famous Hot Dogs and the Freak Show, this place might look different than it did at its peak at the turn of the century, but it's still loaded with iconic NYC gems. Plus, it's always nice to dip your feet in the ocean after all that walking! You can't visit New York without trying a slice of New York-style pizza! Franny's in Brooklyn is nice enough for a relaxed, sit-down dinner. Order some wine and the pie with meatballs if you're feeling ravenous, or the pizza topped with clams if you're feeling adventurous. Part bowling alley, part restaurant, part bar, and part music venue...Brooklyn Bowl is a lot of things, which might be why it's so popular. Grab a drink, listen to whatever show happens to be going on, and enjoy the people-watching! Ramona is a totally different side of Brooklyn than Brooklyn Bowl. The craft cocktail bar serves up inventive and delicious drinks in a beautiful, sort of vintage-y environment. Order something different, like the Osculum Infame, with peppercorn rum, vermouth, lillet, Campari and an absinthe rinse. The Gibson is a no-frills neighborhood hangout with an impressive selection of whiskey and beer, a friendly crowd of locals, and a foosball table, just for kicks. Fancy drinks and showy decor can be fun, but they're definitely not requirements for a good night! Located in the West Village, The Jane Hotel is easily one of the most unique hotels in all of New York, the kind of place that people describe as "having character," but that's putting it mildly. The walls of the beautiful 200-room hotel, built well over a century ago, have seen more history than most buildings - and weirder history, for sure. It was originally a sailors home that housed Titanic survivors when they arrived to New York on the Carpathia, it then became a YMCA "transient hotel" where superstar drag queen RuPaul lived for awhile. Then it spent some time as the Riverview Hotel before being turned into The Jane. It looks like something out of a Wes Anderson film, complete with bellhops in classic uniforms, and 150 standard rooms inspired by luxury train cabins the likes of which were seen in "The Darjeeling Limited." Stuffed monkey bellhops dot the lobby, a vintage manually-operated elevator transports luggage to the rooms, and the former home of The Jane Street Theater, where live theater shows like Hedwig and the Angry Inch were conceived, is now a hip bar where guests can grab a drink before turning in for the night. Since you're in New York, finding a good place for a boozy brunch is mandatory. Prune is an East Village favorite for late-morning eating, with its tasty eggs Benedict, Dutch-style pancakes, and long list of Bloody Mary variations (the Chicago Matchbox style, with house-pickled veggies, is much beloved). Head down to the harbor and hop on a ferry out to NYC's most famous icon: the State of Liberty. Whether you've bought tickets to tour the museum in the pedestal and to access the crown, or you just want a closer view of Lady Liberty, it's definitely something to cross off your bucket list. Ferries to the Statue of Liberty also pass by Ellis Island, the building that processed the many immigrants that came into America via New York City, creating the vibrant culture for which the city is known. Hop off here and tour the museum and facility, and imagine what it must have been like arriving in a new country, thousands of miles away from home, where you might not even speak the language or know anyone! Head to the famed Katz's Delicatessen for lunch...but bring an appetite, because the sandwiches are utterly massive. Mouthwatering sandwiches piled high with pastrami, brisket, corned beef, and other meats can feed at least two hungry patrons. Top it off with pickles and matzoh ball soup. Bonus: this is where the famous "I'll have what she's having" scene from "When Harry Met Sally" was filmed! The Empire State Building might not be New York's tallest skyscraper any more (with the completion of One World Trade Center), but it's still the city's most iconic! At 102 stories, it was the world's tallest building from 1930-1970, which is an impressive run, and its gorgeous art deco exterior makes it all the more worth visiting. It might seem like a touristy thing to do, but you won't regret making the journey to the observation deck at the top once you see the views! Another popular spot to visit in NYC, Rockefeller Center is also an art deco skyscraper that offers great views of the city. If you happen to be visiting in the winter, you can go for a spin on the fabled ice skating rink, or if you're a TV buff, you can marvel at the history here: shows like the Today Show, NBC Nightly News, the Tonight Show, Thirty Rock, and of course, Saturday Night Live are filmed here. You can tell just by looking at the outside of the Metropolitan Museum of Art that it's the biggest art museum in the country: the building is massive. With more than two million masterpieces inside, it helps to pick out a few must-see exhibits, galleries, styles of art, or pieces, and just hit your personal must-sees at the Met. Pro tip: the Costume Institute uses the Met's galleries to host two different exhibits each year, and they're always outstanding. Designed in the 19th century by Frederick Law Olmsted and Calvert Vaux, every year around 40 million people traipse around New York's Central Park, a lush oasis, smack dab in one of the busiest and most-populated cities in the world. You could spend days exploring the 843 acres of hiking trails, walking paths, lakes, gardens, museums around the perimeter, and more (there's even a zoo, and the 19th century Belvedere Castle). Tavern on the Green is a landmark eatery that went from being a barn that housed the sheep who grazed in the meadows of Central Park to an" elegant but affordable" eatery, known for its outdoor patio and bucolic views between the 1930's and early 2000's. It closed for a few years before undergoing a massive renovation and re-opening. Grab a post-dinner drink at the historic PJ Clarke's, which has been open since the 1800's. Nat King Cole was a fan of their bacon cheeseburger (and even went so far as to call it the "Cadillac of burgers") and Buddy Holly proposed to his wife here...on their first date! Other celeb patrons include everyone from Jackie Kennedy and Frank Sinatra, to Dave Matthews and Johnny Depp. 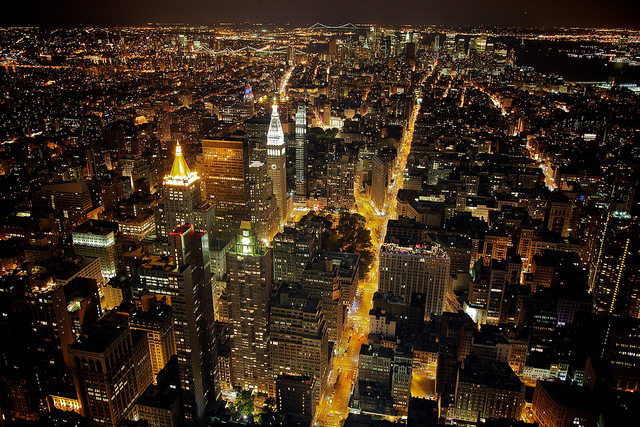 End your trip through the Big Apple with a view of Times Square, all lit up at night. You'll fully appreciate why they say that New York is a city that never sleeps once you've experienced the hustle and bustle here. You don't need to stop in any of the touristy attractions (although you totally can if you want) to get the Times Square experience: just take it all in! Winters are cold and snowy in NYC, but the Macy's Thanksgiving Parade and Christmas in New York are absolutely magical. Spring is also a nice time to visit, before the heat and smog of summer set in... but there's no denying that warmer weather makes all of the walking that you'll be doing a lot more pleasant.